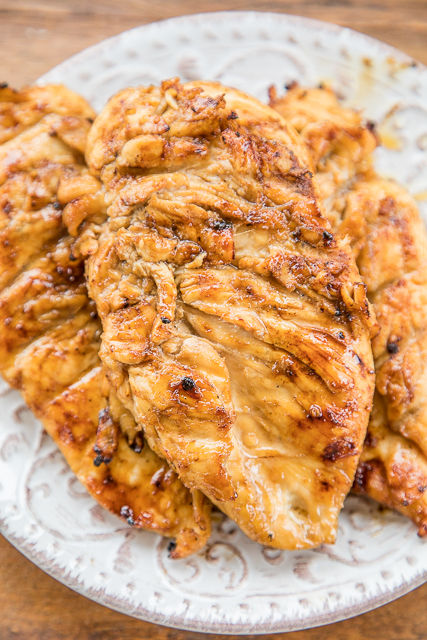 Grilled Bourbon Chicken - seriously delicious!!! Let the chicken marinate a few hours or overnight for maximum flavor. We ate this chicken two days in a row!! Can't wait to make it again this weekend!!! SO tender, juicy and packed full of AMAZING flavor!! 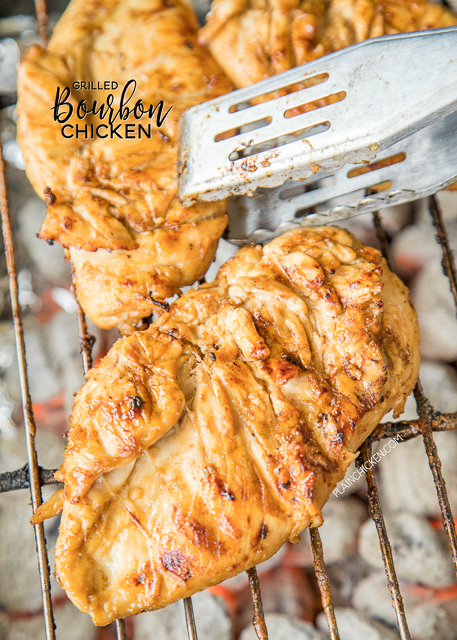 This Grilled Bourbon Chicken is off the charts delicious! It is super simple to make and it is packed FULL of amazing flavor!!! We let the chicken marinate overnight and it was simply delicious. A little sweet and a whole lot of yum! We've eaten this several times over the past month, and it was great every single time. 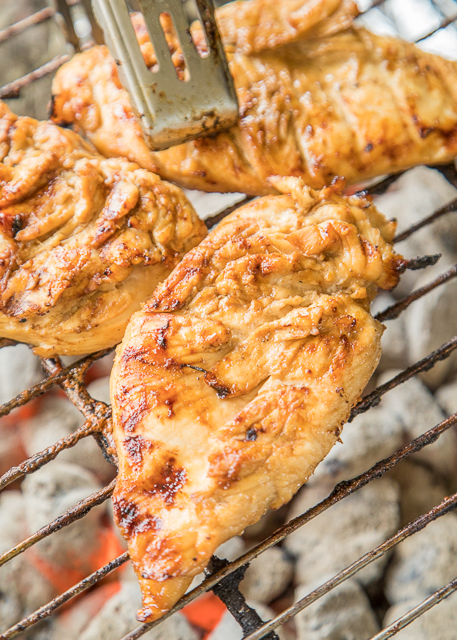 The key to getting perfectly delicious grilled chicken is to pound your chicken breasts to an even thickness before marinating. We use a meat mallet and pound out the hump. You want the whole breast to be the same thickness. This keeps the chicken from drying out while grilling. You aren't waiting on the thick end to cook while the skinny end is drying out. I promise that it makes all the difference! We served this Grilled Bourbon Chicken with some sautéed mushrooms and rice. We had leftovers for lunch the next day and it was equally delicious. This chicken would also be great served on top of a salad or chopped up in a quesadilla. Whisk together bourbon, Worcestershire, red wine vinegar, soy sauce, dijon mustard, garlic and brown sugar. Place chicken in a gallon ziplock bag. Pound chicken to an even thickness with a meat mallet or rolling pin. Pour marinade over chicken. Seal bag and refrigerate 2 hours to overnight. 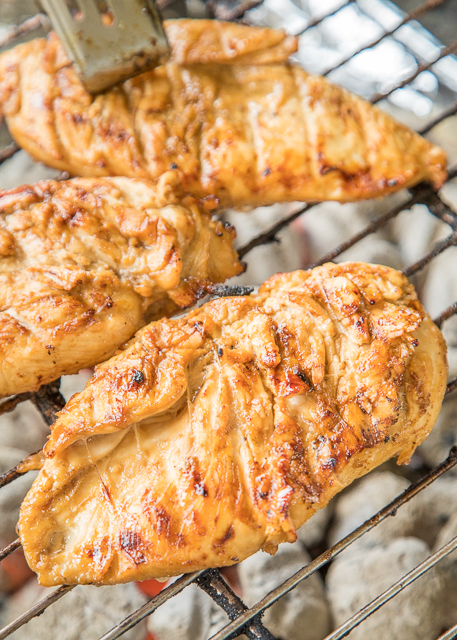 Remove chicken from marinade and grill until done, 12 to 15 minutes.